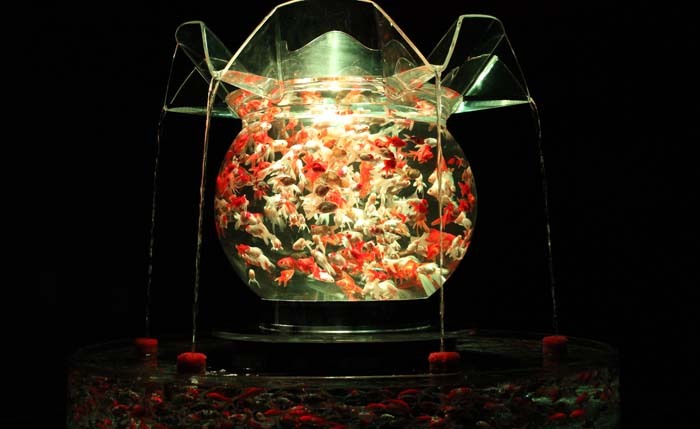 Art Aquarium exhibition centers on goldfish and various shape aquariums to create a very Japanese harmonious atmosphere. A fantasy aquarium art exhibition is currently being held on the 6th floor of Palette Kumoji Ryubo department store in Naha. The exhibition is scheduled to run through Nov. 15th. 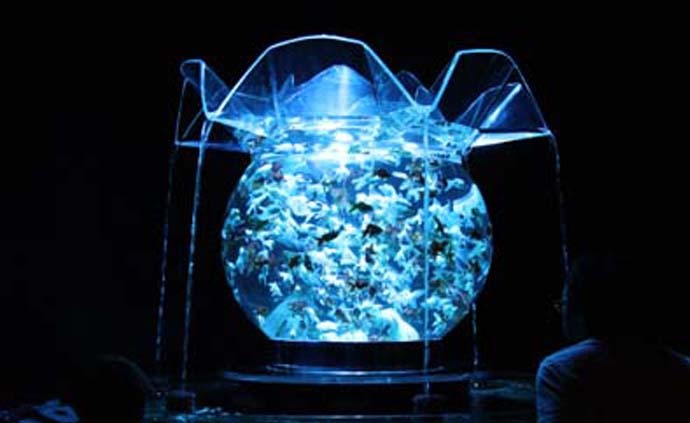 The next question coming to mind is what is the Art Aquarium? Yes, there are many aquariums at the venue, and each of them contains goldfish of every size, from small to huge. Some of them are very rare kind, and valued up to a million dollars. 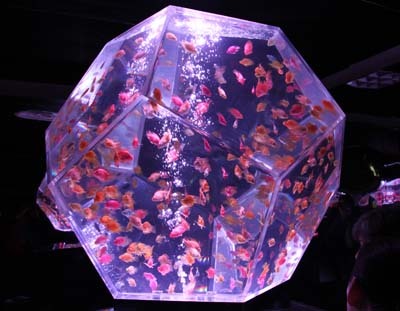 The producer of the Art Aquarium exhibition Hidetomo Kimura explains his project on his official website http://h-i-d.co.jp/art/exhibition/#history. The shapes and colors are carefully matched to create a unique effect. “Since putting myself in the world of aquariums, I have met many fish in many countries. Since starting my job by collecting fish from seas worldwide, I was attracted to the colorful beautiful fish, which are a natural grace of the sea. “Of course I still have this feeling but since I started my activity as Art Aquarium artist, I have become especially deeply attracted to the mysterious beauty and natural simplicity of kingyo (goldfish). “When I create an artwork, which is completed by putting fish inside, I inevitably tend to choose kingyo. The reason is probably because kingyo itself is a work of art, created by a human hand. As a person creating art, I believe I am attracted to art. “When I hold an exhibition as Art Aquarium artist, I always make Japonism area and express Japan with my artwork using kingyo. The lighting is a very important element. “This is my attempt as a Japanese, and to send new art from Japan to the world. Thankfully, this Japonism artwork and space always get positive reviews. I am so delighted to be able to hold exhibitions in various places with these artworks. Through my Japanese like artwork, I am able to show Japanese culture to many people. the Aquarium sublimely as art and feel the message created inside. direction and ecosystem in the Aquarium tank. Beyond the technology to catch people’s heart, there lies natural beauty this earth has created. Kingyo are created by a human hand but there is no doubt that it is in the providence of nature. 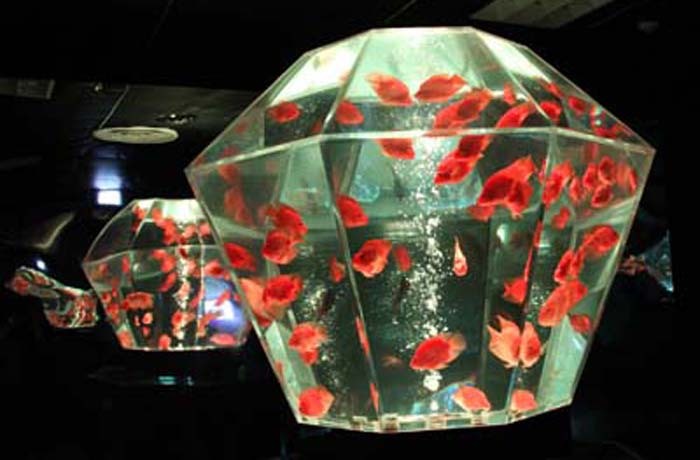 Over 5 million people have visited the Art Aquarium exhibit at various places around the world. 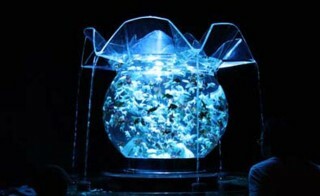 Art Aquarium has been on display around Japan in places like Hokkaido, Tokyo, Osaka, Nagoya, Fukuoka and now, in Okinawa. It was also in Milano, Italy, in May. An audience of 5 million people has seen it already including 30,000 on Okinawa. You feel much Japanese “Wa” (harmony) at the venue with colorful and fantastic goldfish swimming in the unique aquariums and lightning, sound of falling water and background music adding elements to the atmosphere. The exhibition is open from 10:00 – 20:30 (last entry 20:00) everyday. Because many people are expected to come to see the exhibition during the last few days of the event, organizers advise people to come as early as possible. Admission to the exhibition is ¥1,000 for adults and ¥800 for children aged 6~15 at the door. Children under 6 are free. Taking pictures is permitted, but not flash, tripods or taking videos. After watching this special aquarium art, you might want to look for goldfish-related souvenirs like stuffed dolls, handkerchiefs, fans, key chains and more. You also might want to sip some Japanese sake after experiencing so a thoroughly Japanese atmosphere. Sake you can purchase on the basement floor of Ryubo where fresh produce is also available. On the roof terrace of Ryubo there is a Beer Garden with live music everyday until end of October.